Three blocks south of the 6th Avenue Freeway on Union Boulevard. Direct access to both downtown Denver and the foothills. 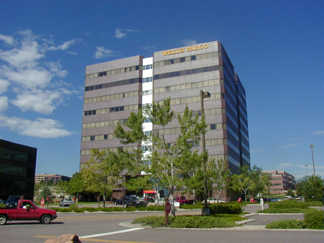 Located in the heart of Lakewood's business corridor, Capitol Suites of Lakewood offers a highly visable office environment rich with amenities, tremendous access and spectacular views of both downtown Denver and the Front Range. Private Executive Office, reception and telephone answering 8-5, six conference rooms on-site and downtown, luxurious reception and common areas, full kitchen with free coffee, interoffice business referrals, 24-hour access to suites, door signage, building directory listing, Notary public, and key access after hours. Additional Services: Copying: through Capitol Suites at $.11/per copy; Facsimile: $1.00/per page. High Speed Internet Access available.